Compact, affordable and versatile device created to make testing easier. 1.1 Who is this board for? 1.2 Where to get it from? MuxPi is a small board designed to aid automated testing system of Tizen binary images. Despite that, it is a very versatile device which can be used for many other purposes. It is an open-hardware and open-software project. Both, the hardware and the software are fully documented and published, so anyone can build such device on their own. 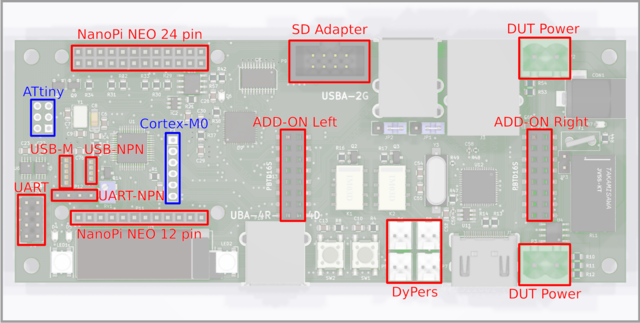 Name of the board relates to its main feature - "SD MUX (Mux)" and its brain - "NanoPi NEO (Pi)". The main goal of this board was to separate user/developer/lab maintainer from a device being tested. The second goal was to reduce number of external connection to the necessary minimum. That's why it was equipped with so many interfaces. MuxPi is also equipped with tool for powering off and on the tested device. Thanks to that, DUT (Device Under Test) can be located anywhere on the planet, provided there is an active ethernet/internet connection. The "sandwich" made of MuxPi and a DUT is connected to the world only with two cables: ethernet and power supply. DUT can be moved away from developer or tester thanks to its many interfaces. It provides ethernet, level shifted UART, USB HOST, USB OTG, USB with power and ID control, DyPers (Dynamic jumPers), power control, microSD card multiplexing, HMDI (DDC), I2C or SPI. All of that allows users to connect nearly all DUT's interface to MuxPi and access them remotely. Most of low level hardware features are controlled by onboard Cortex-M0 microcontroller. But to increase its power it was equipped with linux based SBC NanoPi NEO. It gives power of computing, connectivity, ease of use and even more interfaces. What's more, MuxPi is ready to handle add-ons that can extend its functionality even more. 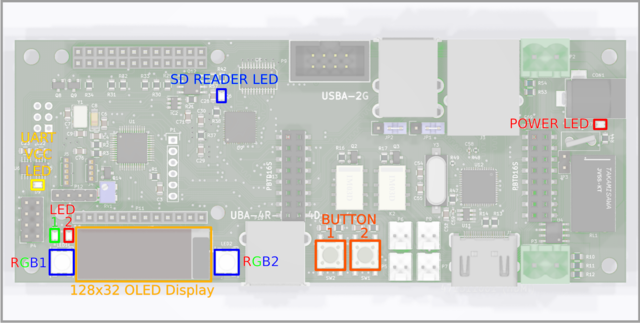 The board also supports a user or a lab engineer with User Interface based on a small 128x32 OLED display, two keys (microswitches), 6 one-color LEDs and two RGB LEDs. And all of that only for about 80$. The board is small, affordable and yet very powerful. MuxPi might be considered as some kind of mother board for NanoPi NEO SBC but it can operate without NanoPi NEO. However in such scenario its functionality is heavily reduced. It is powered from commonly used 5V power adapters with standard 5.5/2.1 DC power plug. Board in this image has mounted NanoPi NEO with heatsink. It is not present on the above, rendered picture. For developers, testers, test labs, makers... Anyone who has an idea about automating some tasks. Here MuxPi comes with help providing ease of use, distribution and connectivity. Don't think how to get your device accessed remotely, just do it with MuxPi. Needs to be build on your own, at least for now. However it is not that easy to assemble this board without very specific tools, soldering skills and huge amount of patience. One obstacle is to collect all the components, second obstacle is to manufacture the PCB and finally the biggest obstacle is to assemble the board. To be honest, if you wonder whether you can assemble this board or not then most likely you can not. In such case make someone to make it for you. 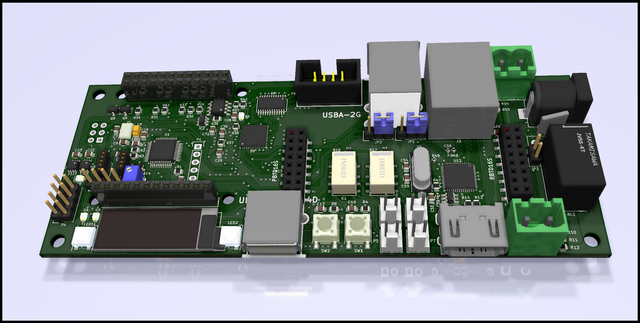 Main board is filled with all needed interfaces, user interface components and converters. Among them, lies a microcontroller to rule them all. The microcontroller is STM32F030C6T6 (Cortex-M0). Its main task is to help NanoPi NEO with low level tasks. NanoPiNEO is a SBC (Single Board Coumputer) based on Allwinner H3 (Cortex-A7) microprocessor at 1.2GHz, quad core with 512MB of RAM. It's linux based microcomputer with ready to be used ubuntu-core distribution. It's MuxPi's brain. It allows to perform tasks on MuxPi almost like it were a regular PC. NanoPi NEO uses Cortex-M0 microcontroller to control peripherals present on the main board. NanoPi NEO itself does not have enough GPIOs and local interfaces to handle all of the peripherals. It communicates with the microcontroller through UART (/dev/ttyS2) using simple text protocol. List of all supported commands is accessible directly from microcontroller through "help" command. 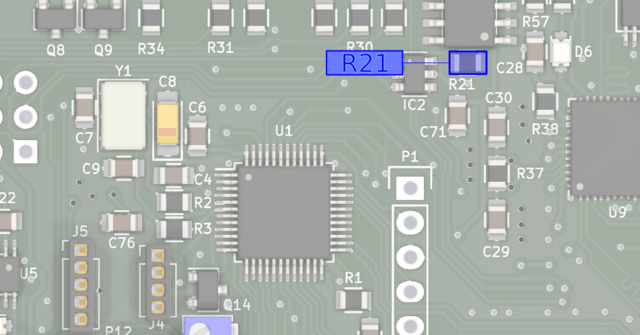 There is a small, third microcontroller located on the main board. It is AVR ATtiny10. It acts as a watchdog. 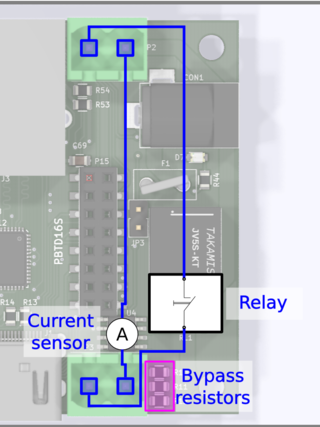 Its reset input is connected to Cortex-M0 as there is no free GPIO on NanoPi. Using microcontroller for this task allows to freely choose time interval. The time has to be specified in its binary firmware. UART voltage generator - not present in the block diagram as it is part of UART. It allows to generate voltage in range from 0 to 5V. USB switch (not a HUB) - switch is the same but in MuxPi it does totally differnt thing. It is used to redirect USB-M data lines either to NanoPi's USB or NanoPi's UART. The whole rest of functionalities makes MuxPi far more powerful and versatile device than SD-MUX. user interface - SD-MUX was totally blind device. User couldn't tell in what state the device was. Hou couldn't even tell whether the devices is turned on or off. MuxPi has several LEDs, graphic OLED display and two buttons. It may look a little bit to much for such device but experience in using SD-MUX showed that operator needs information that can't be passed using just LEDs. independency - SD-MUX was not a standalone device. It had to be connected to some powered USB host - usually a PC or server. MuxPi is a completely standalone device with its own microcomputer and linux operating system. It needs only an ethernet connection and a power supply. This section describes all parts of MuxPi that are a subject of interaction with a user. It describes every part that a regular user has to deal with. e.g. power supply, buttons, USB, etc. These are standard connectors of witch pins are not a subject of this description. POWER - 5V Power supply connector. Typical barrel receptacle 5.5/2.1 ensures that widely used, typical power adapters can be used to power the board. Power consumption of MuxPi should be less then 1A assuming no addons connected. HDMI - Full-sized HDMI connector with connected only DDC channel wires, hot plug pin and GND/VCC pins. It is meant to be EDID injector into a DUT's HDMI output. It is connected to Cortex-M0 microcontroller. ETH - standard RJ45 with built in LEDs and transformer. 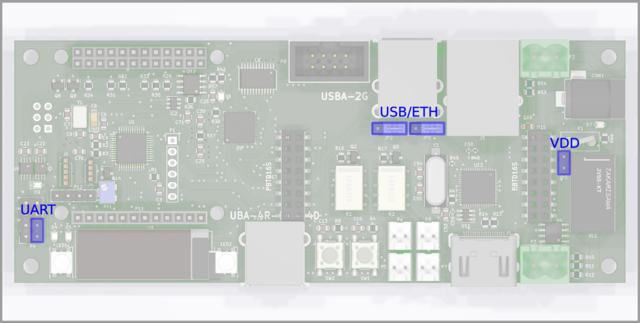 It is a connector for LAN9500A ETH<->USB converter which is connected to NanoPi through onboard USB HUB USB2640. 1x USB-A - USB-A Host interface connected directly to NanoPi NEO. Power supply of this connector is not controllable by NanoPi. It is always present. 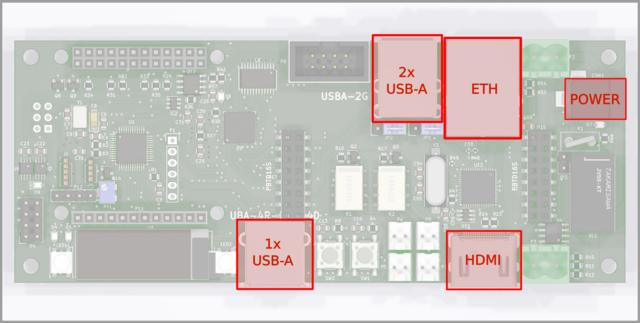 2x USB-A - USB-A Host interfaces connected to NanoPi NEO through onboard USB HUB USB2640. NOTE: ETH and upper USB of double USB socket share the same USB channel from USB HUB. Jumpers located at the rear side of double USB connector allow to disconnect this USB from ETH and connect to add-on connector. Details on this topic are covered in jumpers section. This is smart UART for connecting NanoPi NEO to a DUT. There is no need to use dedicated converters for particular boards because MuxPi has special level shifter which takes care for adjusting voltages of UART lines for both sides: NanoPi and the DUT. To take advantage of this shifter, pin VCC must be connected to power pin on DUT's board. This is 4-wire UART which means that it can communicate using hardware flow control. Vloc - local voltage - voltage may be generated internally on MuxPi if the DUT, or anything else we are connecting to, has not power pin. Nn such case voltage generator must be set to desired value and activated. Command "uart 3300" must be sent to Cortex-M0, where 3300 is desired voltage given in millivolts. The voltage range is from 0 to 5000mv. Pins Vloc an VCC must be connected eachother. Typical jumper is a perfect connector for this purpose. Vloc may be also used to power up additional converter . For example if converter to RS232C (+/-12v) must be used then it may be pwered from Vloc pin. VCC - power of DUT. If dut has no such power pin then it must be connected to Vloc and vloc must be cinfgure properly as stated above. NOTE: RX, TX, XTS, RTS are crossed on the board so you don't need to cross the wires by yourself. NOTE: A device powered from Vloc mustn't draw more than 50mA of current. Below image shows how to connect UART of MuxPi to some device. In this particular case it is 4-wire RS232C converter which must be powered from external (from converter's point of view) power source. As stated above, wire cross is done on MuxPi board so cable should not be crossed. However in this image you can see cross because of strange labeling pins on the converter. You can see in the image that Vloc and VCC are connected. In this example Vloc is used to power up the converter and bias the level shifters (VCC). This is USB connector dedicated to mobile devices from Samsung company. This connector has controllable Vbus line and also controllable ID line. UART/USB switch which allows to redirect mobile's USB data lines either to NanoPi's USB or to MuxPi's DUT UART. connect resistor (potentiometer) to ID pin - potentiometer should be set to the correct value before the whole procedure is started. The value should be valid for UART mode. now the device should boot with the new binary image and USB connection can be used to run tests. This is an example which perfectly works with Samsung mobile devices. However it might be possible to execute similar procedure with products of other brands if they support such functions. NOTE: Special USB cable needs to be used as commonly available cables do not have ID pin connected. So special cable needs to be made. I do not attach schematic cable because there is nothing special about that. Micro USB connector pinout can be found on the internet and pinout of MuxPi connector is shown above. All what needs to be done is to connect pins of both connectors. This connector is used to connect microSD card, put into MuxPi, to a DUT. It is exactly the same connector as in SD_MUX which accepts exactly the same cables that were used for SD_MUX. MuxPi can be easily extended by connecting to it add-on boards. There is one, reference add-on designed as universal board which can be good start for designing custom add-ons. 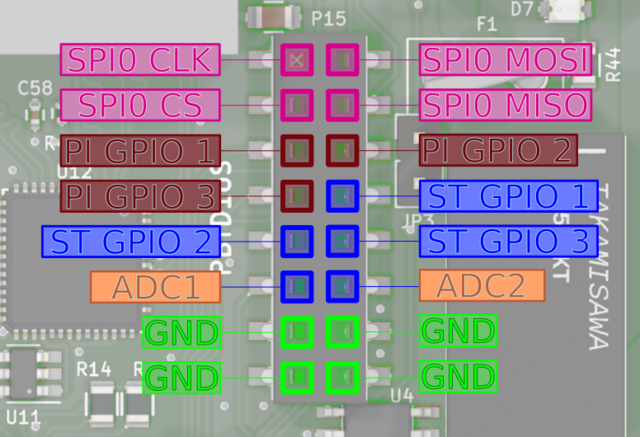 PI GPIO 1,2,3 - GPIO (General Purpose Input/Output) connected to NanoPi NEO. Ports PG11, PL11, PA17 respectively. ST GPIO 1,2,3 - GPIO connected to Cortex-M0 microcontroller. Ports PB3, PB4, PB5 of STM32F03C6T6 respectively. ADC1,2 - analog inputs connected to analog to digital converter of Cortex-M0 microcontroller. Ports PA1, PA2 respectively. Voltage range of this input is 0 to 3.3V. This lines are not buffered in any way so attention must paid when dealing with them. NOTE: PI GPIO 1 has additional special function. It is connected to Cortex-M0 Boot0 pin which enables firmware download mode during microcontroller boot. 1 - enables this mode while 0 disables it. So it is useless as GPIO when the microcontroller is being booted. Dynamic jumPers, so called DyPers, are simple switches that can act as a regular jumper or switch. It is meant to help automatization when jumpers or push buttons are used on a DUT. Excellent example are ARTIK boards. They can't be booted just by powering them on. After applying power, the user must press "Power on" button. Such requirement rules out automated testing because the device can't be booted. And that's what DyPer does. Two-wire cable needs to be soldered to pins of the button and connected to one of DyPers. Using software it can be switched on and off what simulates pressing the button. Dyper is a small, electromagnetic relay which is controllable by software. There are 2 dypers on MuxPi board. Each of them has two channels. Both channels are switched at the same time with the same command. So both of them can be on and both can be off but there is no way to turn one on and one off. At the first sight it looks like a bug but it is not. It is useful for jumpers. If for example some board needs to have 2 jumpers linked for flashing mode and 0 jumpers linked for normal operation then only one DyPer with two channels may be used. These two channels are separated galvanically so there is no worry that there will be some kind of influence. Why electromagnetic realys instead of silicon switches? Because we don't wan't to deal with some relation of steering and operating signals. NOTE: DyPers can be used for other purposes e.g. power switch - it can switch 0.5A signals. This circuitry is meant to be a hardware resetter for a DUT. This is cruel reset but sometimes it is the only way to reset some device. It is based on electromagnetic relay controlled by Cortex-M0 microcontroller. Why electromagnetic relay instead of some kind of silicon switch? Because almost all silicon switches have some influence and relation between steering and operating signals. We could use SSR relays but it is not cost effective solution. Power switching - it can switch switch power supply up to 5A and 250VAC. One line is connected directly and one is connected through realy. SD-MUX has the same feature, however with different realy and both lines switchable. Relay on SD-MUX is bistable so quite expensive. It was important to use such relay because SD-MUX is powered only from USB port. MuxPi is powered from external power supply so this condition is no longer valid and we can use much cheaper monostable relay. Current measurement - It is able to measure up to -/+5A and is galvanically isolated from the rest of components thanks to use of Hall effect current sensor ACS712ELCTR-05B-T. It is connected to unswitchable power line. The current sensor is bypassed with 3 0R resistors tha can be populated if current sensor is not needed. These resistors must not be populated if current measurement is required. Current measurement was not present in SD-MUX. Thanks to electromagnetic realy and Hall effect current sensor, power line is galvanically separated so MuxPi can control power of any kind. It may be DC or AC, low or high voltage or polarized in any way. Of course nothing forbids connecting MuxPi's circuitry with this power line but user must be aware of such connection. There are only 4 jumper on MuxPi board. Two of them were already explained. UART - pins Vloc & VCC - if jumped then internal voltage generator is used as voltage reference for data lines and powers up target device. If open then voltage reference for data lines comes from target device and internal voltage generator is unused. USB/ETH - determines what USB data lines of one USB HUB are connected to. 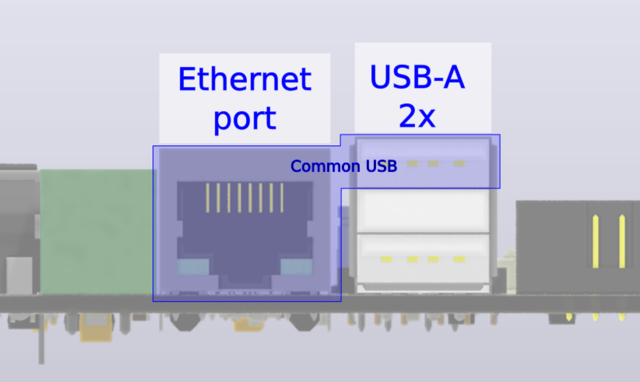 One downstream channel, outgoing from onboard USB HUB, is always connected to upper socket of double USB-A connector. It can be also connected to either add-on connector or onboard USB<->ETH converter. If first two pins are jumped then USB lines are connected to add-on connector. If last two pins are jumped then these lines are connected tu USB<->ETH converter. If none of the pins are jumped then the only connection is the upper socket of double connector. 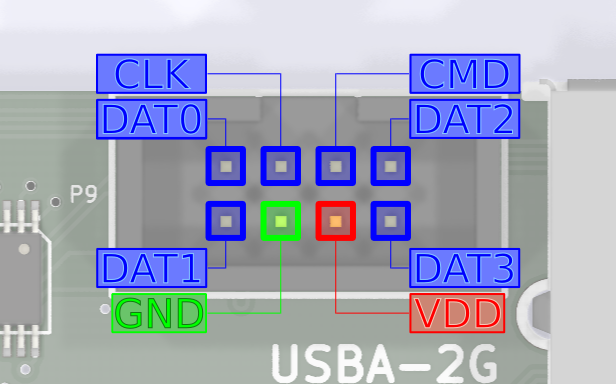 NOTE: The upper socket of double USB-A connector must be lefty empty if USB<->ETH is selected or add-on connector is selected and something is connected to these data lines on the addon! NOTE: Both jumpers must be placed in the same position! VDD - if this pins are jumped then the VDD and 3V3 are always on. If this is left open then VDD and 3V3 are controlled by NanoPi. Having the voltage always one may be helpful when MuxPi is to be used without NanoPi NEO board. The best example is setting value of USB ID potentiometer. The potentiometer is located underneath NanoPi NEO so it must be removed in order to do the adjustment. But when NanoPi NEO is removed there is no way to turn on power for microcontroller. And that is the moment when VDD jumper comes into the action. Just simply connect pins with jumper and power is on. Don't forget to take of the jumper after the work is done. NOTE: If there is no particular need then leave this jumper open. MuxPi, in contrast to SD MUX, has quite reach user interface. It is bidirectional which means it can give some information to an operator as well as it can receive it from them. RGB1, RGB2 - two general purpose, RGB LEDs connected to Cortex-M0 microcontroller. Fully controllable by NanoPi NEO. These are WS2812B LEDs with builtin controller. 128x32 OLED Display - general purpose 0.96" yellow, graphic display. Connected to Cortex-M0 and fully controllable by NanoPi NEO. BUTTON 1/2 - two general purpose buttons connected to Cortex-M0 microcontroller. Fully accessible in NanoPi NEO. NanoPi NEO - not shown in the above picture. Keep-alive blue LED, mounted on NanoPi NEO board. With this UI an operator can be informed about current status of MuxPi and the operator can gently disturb MuxPi in order to perform some actions. Functions of UI are fully customizable. Everything can be controlled from NanoPi NEO. Currently there is only one specific press combination of buttons reserved for specific add-on. This add-on is designed to ease setting of USB ID potentiometer. It must be done with NanoPi NEO taken off the board because the potentiometer is located underneath. To access functionality of this add-on user has to press both buttons and keep them pressed for at least 5 seconds. And this is the only hard coded UI currently exists. add functionalities very rarely used (e.g. 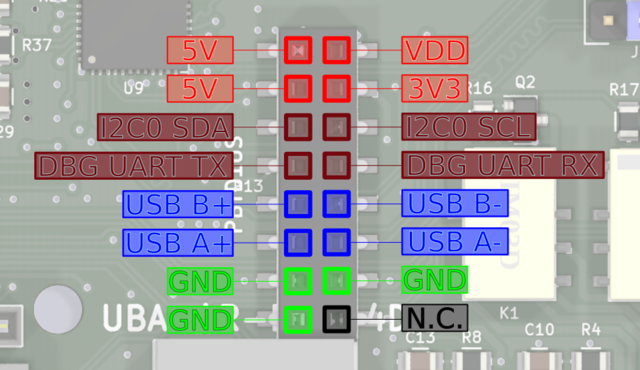 addon for USB ID potentiometer adjusting) - placing them on the board would be a waste of place. 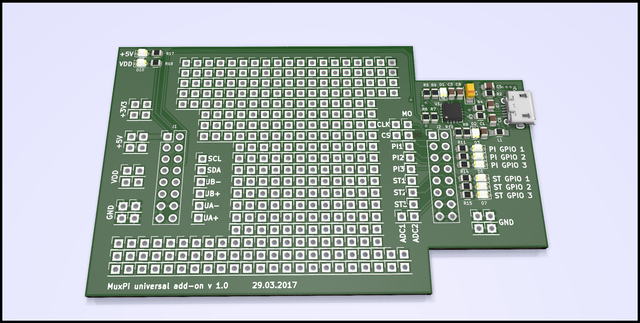 A sample add-on was designed to provide board template for users specific boards. Its dimensions are as big as possible with special cutouts for power plugs. NanoPi NEO - the most advanced one. It is Linux based microprocessor. Cortex-M0 microcontroller - this one is responsible for low level actions and is only a slave for NanoPi NEO. ATtiny10 - a small AVR microcontroller which is used only a watchdog for NanoPi NEO. All of the above units need software. NanoPi NEO needs some distribution of linux, burned on micro SD card. There are ready to use distributions like ubuntu core. There is also a small distribution dedicated to MuxPi. This distribution is provided by the same team which designed MuxPi. <TODO: here should be a link to this distribution but there is no public place to store it and make it available to everyone>. Second solution is preferred as there is no single hardware nor software tool required. All what needs to be done is to download the binary and execute flash_firmware script with the file name as an argument. It is true only if distribution of NanoPi NEO contains proper software. To be sure just use MuxPi dedicated distribution. ATtiny10 microcontroller also needs firmware. Unfortunately this one needs special interface e.g. like this: http://www.fischl.de/usbasp/ or any other interface which is able to flash this microcontroller over TPI interface. Also for this microcontroller there is a full source code and ready to flash binaries. If watchdog functionality is not desired then instead of flashing firmware into ATTiny, R21 can be removed form MuxPi board. In such situation NanoPi NEO will always be powered on. 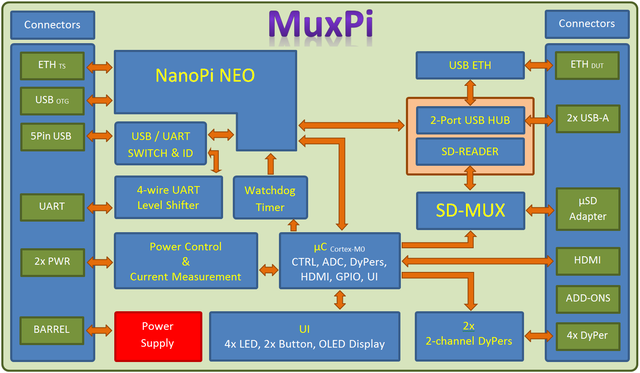 All MuxPi's features are accessible on NanoPi NEO. Most of them are accessible through Cortex-M0 microcontroller. matrix-gpio_out 15 1 # This command turns on power for MuxPi. matrix-gpio_out 15 0 # This command turns it off. matrix-gpio_out 7  1 # This command sets Cortex-M0 microcontroller to flashing mode. Now the microcontroller is ready to accept firmware through serial port. 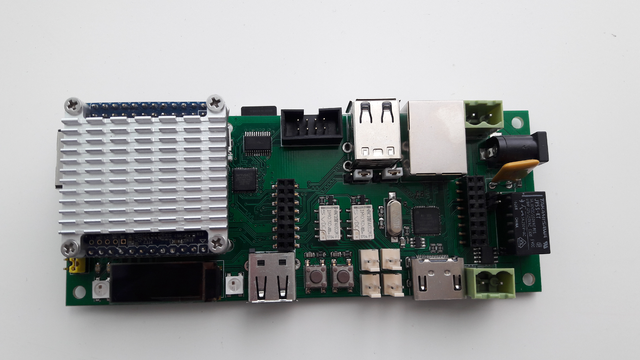 This port is connected to /dev/ttyS2 serial port on NanoPi. The microcontroller can be flashed using stm32flash utility. Its binary can be found on dedicated OS image for MuxPi. After flashing is done the microcontroller must by turned off and turned on with boot mode set to '1'. matrix-gpio_out 7  0 # This command sets Cortex-M0 microcontroller to execution mode. matrix-gpio_out 15 1 # This command powers up MuxPi. A script performing the whole process is located on MuxPi's dedicated OS image. NOTE Pin 1 and 2 are not the real pins of NanoPi NEO. These pins represents pin 6 and 7 of the second, single row, connector. It is because of limitations of matrix library which does not handle the connector. Above example shows execution of command 'version' and returned response. echo --- Get (no arguments) or set ('on' or 'off') echo on serial "console": echo [on|off]. The default value is on. SD adapter is put into USB SD card reader which is put into DUT's USB port. This one is much easier to do and doesn't wear NanoPi's SD card. MuxPi can be even used to flash/boot and test microcontrollers. Flashing can be done via GPIOs, some external (probably USB) interface, UART or any other interface. It depends on microcontroller's flash/boot capabilities. Thanks to open hardware and open source, microcontroller's firmware and NanoPi's software can be modified to adjust MuxPi to particular needs.